Comments Off on TRC Runners Defy Sub-Zero Temperatures! 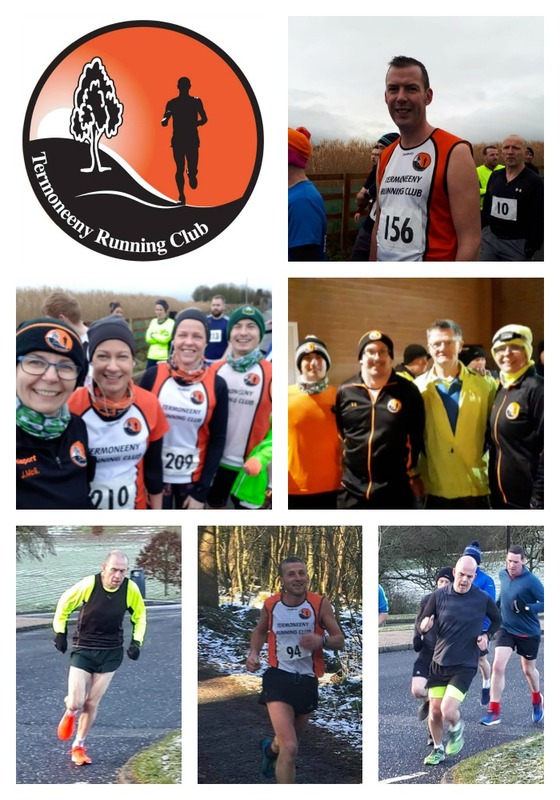 The sub zero temperatures made it a difficult week for running but thankfully some events were able to go ahead and Termoneeny Running Club members were keen to begin February with a few fixtures. The icy terrain did not impede upon the speed of TRC members and, notably, Tommy Hughes was recorded as the 4th fastest park runner in Ireland on Saturday morning. The last running event in January, attended by TRC members, took place in Omagh on Tuesday night and was hosted by KC Runners. This special 5k was organised to celebrate the 70th birthday of their member, Philip McNamee, and all proceeds from the run were donated to Cuan Mhuire, Ireland’s largest voluntary provider of addiction treatment services and residential rehabilitation. It was a very cold evening but all the participants were rewarded with warm refreshments and birthday cake afterwards in McGinn’s bar. Well done to the TRC members Jacqueline, Declan and Sean who took part. It was an exceptionally cold Saturday morning but three TRC members braved the conditions and delivered fantastic performances at MUSA parkrun. Tommy Hughes, who is running in top form, broke the 17 minute threshold with a new parkrun personal best of 16:49 and he finished in 1st place. Parkrun statistics revealed that this result placed Tommy as the 4th fastest park runner in Ireland on that particular day. Also obtaining a parkrun personal best at MUSA was Shane Hurrell who completed the course in a fantastic time of 20:39. Anne O’Doherty had a terrific run and finished as 3rd female in a swift time of 22:37. The penultimate event in Sperrin Harriers’ Winter Series was a 10k in Drum Manor forest on Saturday morning. With snow still lying on parts of the course, it was certainly both chilly and challenging but Thomas Doherty had an impressive race and finished in 42:31 which placed him 9th out of a strong field of athletes. Well done Thomas and appreciation is forwarded to Sperrin Harriers for another well organised and welcoming event. The annual charity fundraiser for St. Vincent de Paul took place on Sunday morning with the option of running a 5 mile or 10 mile race. Both courses provided lots of hills to ascend but the worthy cause for which the race was organised made the effort worthwhile. Well done to all participating TRC members. ⇐ 2nd Marathon of the Year!